Did ISPR Just Announce That Husain Haqqani Was Right? A few weeks ago, America announced that it would sell Pakistan $1 Billion in new weapons including AH-1Z Viper Attack Helicopters and AGM-114R Hellfire II Missiles and associated equipment, parts, training and logistical support. These weapons will help support counter-terrorism operations…at least that’s how the story goes. While most people cheered the agreement for bringing a needed injection of new material to our defence forces and a sign of improved relations with the US, some criticised the agreement. Former Ambassador Husain Haqqani responded with a piece in the Wall Street Journal that did not mince words: “American weapons will end up being used to fight or menace India and perceived domestic enemies instead of being deployed against jihadists.” The response to Haqqani’s analysis was unsurprising, to say the least. Sheikh Rasheed blasted him on the airwaves while retired bureaucrats blasted him in print. But on Tuesday, the tables may have been turned, and by a most unexpected party. 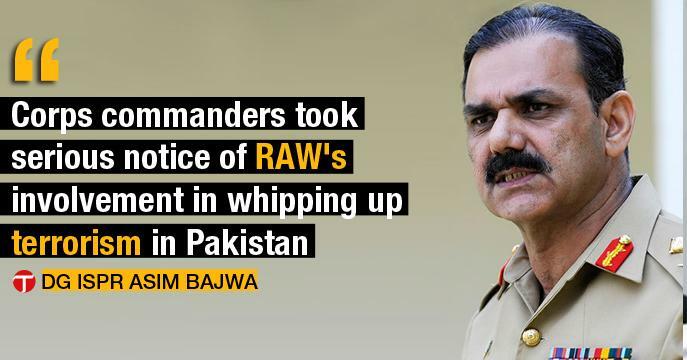 “The conference also took serious notice of RAW’s involvement in whipping up terrorism in Pakistan”. This is nothing surprising or even particularly new. Indian machinations have been blamed for all manner of terrorism in Pakistan since long. Whether it is reports of Indian currency being discovered terrorist hideouts or claims that terrorist camps are being run out of Indian consulates in Afghanistan or claims that political parties are secretly RAW terror cells, there seems to be no problem that we have not been told can be traced back to an Indian plot to destabilise Pakistan. Let us then take the Corps Commanders at their word and accept that terrorism is a product of Indian operations? If that is the case, wouldn’t counter-terrorism operations necessitate that the American helicopters and missiles be used “to fight or menace India”? Surely our military would not stop short of defeating the root cause of all our problems? If that is the case, if Army leadership from the top down truly believes that terrorism in Pakistan is caused by India, then they can be 100 per cent correct when they say that all of these billions in new weapons will be used to fight terrorists, and Husain Haqqani can also be right when he says that they will be used to fight India. I am not going to tell you that India is not behind terrorism in Pakistan. And I am not going to tell you that Husain Haqqani is correct that American weapons will be used against India. But it cannot be denied that if one is true, the other must be also – even if we don’t want to admit it. This entry was posted in Blogs and tagged America, husain haqqani, india, ISPR, terrorism, weapons by Mahmood Adeel. Bookmark the permalink.